AUTHENTICATION- BECKETT AUTHENTICATION SERVICES BAS BGS. KENNY BAKER AS R2-D2 FROM STAR WARS A NEW HOPE 1977. SIGNED TRADING CARD BY. ANTHONY DANIELS AS C-3PO & KENNY BAKER AS R2-D2. AUTHENTICATION- BECKETT AUTHENTICATION SERVICES BAS BGS. SIGNED TRADING CARD BY. MARK HAMILL AS LUKE SKYWALKER. AUTHENTICATION- BECKETT AUTHENTICATION SERVICES BAS BGS. SIGNED TRADING CARD BY. AUTHENTICATION- BECKETT AUTHENTICATION SERVICES BAS BGS. SIGNED TRADING CARD BY. TIM ROSE WHO WAS PUPPETTER FOR SALACIOUS CRUMB. AUTHENTICATION- BECKETT AUTHENTICATION SERVICES BAS BGS. SIGNED TRADING CARD BY. PETER MAYHEW AS CHEWBACCA. AUTHENTICATION- BECKETT AUTHENTICATION SERVICES BAS BGS. SIGNED TRADING CARD BY. Condition: BGS 9.5 GEM MINT AUTHENTICATED (POP 1!). FEMI TAYLOR WHO PLAYED OOLA. AUTHENTICATION- BECKETT AUTHENTICATION SERVICES BAS BGS. SIGNED TRADING CARD BY. AUTHENTICATION- BECKETT AUTHENTICATION SERVICES BAS BGS. JOHN WILLIAMS THE COMPOSER & LEGEND. FROM ENTIRE STAR WARS SERIES. SIGNED TRADING CARD BY. BRIAN BLESSED WHO PLAYED BOSS NASS. AUTHENTICATION- BECKETT AUTHENTICATION SERVICES BAS BGS. SIGNED TRADING CARD BY. IRVIN KERSHER (THE DIRECTOR) & GARY KURTZ (PRODUCER). AUTHENTICATION- BECKETT AUTHENTICATION SERVICES BAS BGS. OF STAR WARS EMPIRE STRIKES BACK. SIGNED TRADING CARD BY. MARK HAMILL WHO PLAYED LUKE SKYWALKER. AUTHENTICATION- BECKETT AUTHENTICATION SERVICES BAS BGS. SIGNED TRADING CARD BY. Condition: BGS 9 MINT AUTHENTICATED (POP 1!). 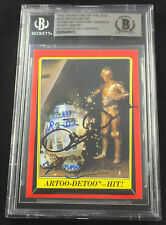 RICHARD BONEHILL SNOWTROOPER TOPPS CARD STAR WARS SIGNED AUTO BAS BECKETT RARE!! RICHARD BONEHILL WHO PLAYED A SNOW TROOPER. AUTHENTICATION- BECKETT AUTHENTICATION SERVICES BAS BGS. SIGNED TRADING CARD BY. IN EMPIRE STRIKES BACK. Condition: BGS 9.5 GEM MINT (POP 1!). Good Luck! BONNIE PIESSE WHO PLAYED LUKE'S AUNT BERU. AUTHENTICATION- BECKETT AUTHENTICATION SERVICES BAS BGS. SIGNED TRADING CARD BY. & ERIK BAUERSFELD WHO VOICED ACKBAR. TIM ROSE WHO PLAYED ADMIRAL ACKBAR. ERIK ADDED "ITS A TRAP" & "VOICE OF ACKBAR" BELOW HIS SIGNATURE. AUTHENTICATION- BECKETT AUTHENTICATION SERVICES BAS BGS. SIGNED TRADING CARD BY. Condition: BGS 9.5 GEM MINT. SP #'d 5/5 1/1. Good Luck! Very RARE Star Wars High Tek SP. Item is much nicer than the pictures above. JOHN HOLLIS WHO PLAYED LOBOT IN EMPIRE STRIKES BACK. AUTHENTICATION- BECKETT AUTHENTICATION SERVICES BAS BGS. SIGNED TRADING CARD BY. PETER DIAMOND WHO PLAYED THE TUSKEN RAIDER. AUTHENTICATION- BECKETT AUTHENTICATION SERVICES BAS BGS. SIGNED TRADING CARD BY. RALPH MCQUARRIE WHO WAS. AUTHENTICATION- BECKETT AUTHENTICATION SERVICES BAS BGS. CONCEPT ARTIST FOR STAR WARS. SIGNED TRADING CARD BY. BILLY DEE WILLIAMS WHO PLAYED LANDO CALRISSIAN. AUTHENTICATION- BECKETT AUTHENTICATION SERVICES BAS BGS. SIGNED TRADING CARD BY. AUTHENTICATION- BECKETT AUTHENTICATION SERVICES BAS BGS. PHIL BROWN WHO PLAYED LUKE'S UNCLE OWEN IN A NEW HOPE. SIGNED TRADING CARD BY. AUTHENTICATION- BECKETT AUTHENTICATION SERVICES BAS BGS. PETER DIAMOND WHO PLAYED A FEW DIFF STORM TROOPERS. SIGNED TRADING CARD BY. GIL TAYLOR THE CINEMATOGRAPHER. AUTHENTICATION- BECKETT AUTHENTICATION SERVICES BAS BGS. SIGNED TRADING CARD BY. GARY KURTZ (PRODUCER). AUTHENTICATION- BECKETT AUTHENTICATION SERVICES BAS BGS. OF STAR WARS A NEW HOPE & EMPIRE STRIKES BACK. SIGNED TRADING CARD BY. ANTHONY PHELAN WHO PLAYED LAMA SU. AUTHENTICATION- BECKETT AUTHENTICATION SERVICES BAS BGS. SIGNED TRADING CARD BY. DAVE PROWSE AS DARTH VADER. AUTHENTICATION- BECKETT AUTHENTICATION SERVICES BAS BGS. SIGNED TRADING CARD BY. HUGH QUARSHIE WHO PLAYED CAPTAIN PANAKA. AUTHENTICATION- BECKETT AUTHENTICATION SERVICES BAS BGS. SIGNED TRADING CARD BY. Condition: BGS 9.5 GEM MINT. Good Luck! Condition: BGS 9 MINT (POP 1). Good Luck! Very RARE Star Wars High Tek. Item is much nicer than the pictures above.